Sale as a Subsidized "Green Gas"
and to all our grandchildren whose entire future depends on its successful outcome. Methane hydrates (clathrates) exist on the Arctic submarine shelf and slope where they are stabilized by the low temperatures and they have a continuous cap of frozen permafrost which normally prevents methane escape (Figure 1 below). However, recent research has shown that millions of tons of methane are already being released in the Siberian Arctic through perforated zones in the subsea permafrost cap with the concentrations reaching up to 100 times the normal, such as in the discharge region of the Lena River and the junction of the Laptev and East Siberian Seas (Shakova et al. 2010). 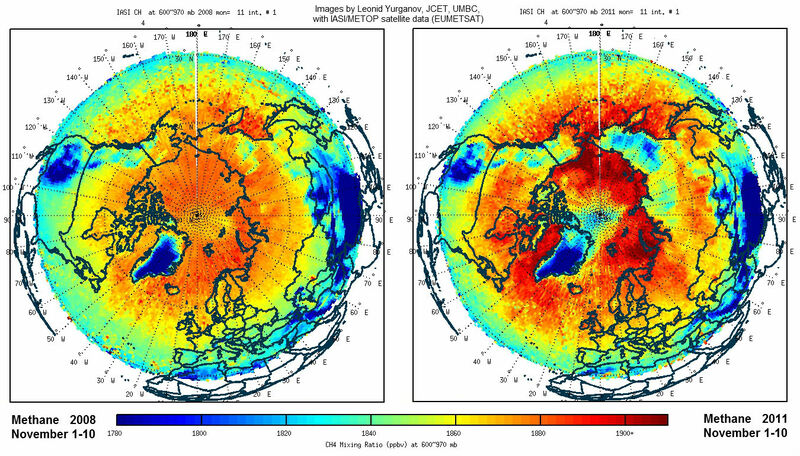 Mean methane concentrations in the Arctic atmosphere showed a striking anomalous buildup between November 1-10, 2008 and November 1-10, 2011 (Figure 2 above)(Yurganov 2012 in Carana, 2012a). The surface temperature hotspots in the Arctic caused by global warming correlate well with the anomalous buildups of atmospheric methane in the Arctic (Figure 3 right, in Arctic feedbacks in Carana, 2012a). 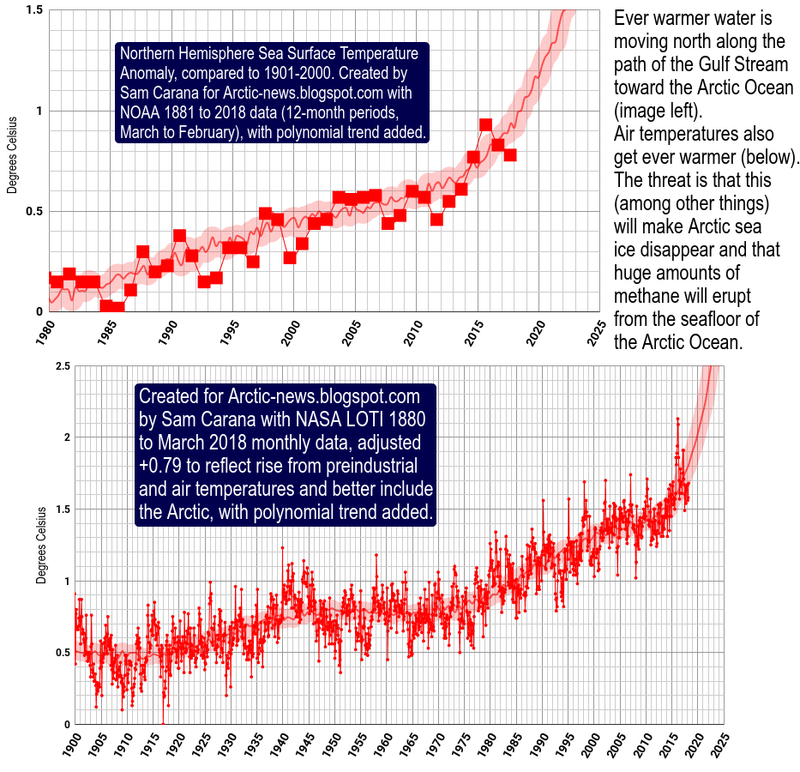 This indicates that there is a strong correlation between the dissociation of Arctic subsea methane hydrates from the effects of globally warmed seawater and the increasing size and rate of eruptions of methane into the Arctic atmosphere. Methane eruption zones (torches) occur widely in the East Siberian Arctic Shelf (ESAS) (Shakova et al., 2008; 2010), but the largest and most extreme are confined to the region outside the ESAS where the Gakkel "mid ocean" ridge system intersects at right angles the methane hydrate rich shelf slope region (Figure 9 above and Figure 17 right). The wedge-like opening and spreading of the Gakkel Ridge is putting the formations and overlying methane hydrate sediments under torsional stress and in the process activating the major strike slip faults that fan away and thrust faults that radiate from this region (Figure 16 below). 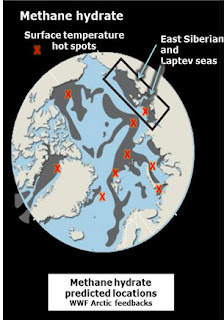 Light and Solana (2002) predicted that the north slope of the Barents - Laptev - East Siberian seas at the intersection of the slowly opening Gakkel Ridge. This region would be especially vulnerable to slope failures where unstable methane hydrate would be affected by seismicity from earthquakes with magnitudes greater then 3.5 Richter and at depths of less than 30 km. Many earthquakes occur along the Gakkel Ridge often with magnitudes greater than 4 to 6 and at depths shallower than 10 km (Avetisov, 2008) continuously destabilizing the already unstable methane hydrates there (Figure 16 below). Major and minor strike slip and normal faults form a continuous subterranean network around the Gakkel Ridge and are clearly charged with overpressured methane because methane gas is escaping from these fault lines many hundreds of km up dip and away from the subsea methane hydrate zones through which these fault zones pass (Figures 9 above and Figure 18 right). One small methane eruption zone occurs directly over the centre of the Gakkel Ridge and probably represents thermogenic deep seated methane being released by the magmatic heating of adjacent oil/gas fields by rising (pyroclastic) magma (Figure 9 above)(Edwards et al. 2001). This surface gas eruption appears to only represent a tiny percentage of the total gas released from other sources such as methane hydrates, as do methane eruptions around Cenozoic volcanics offshore Tiksi on the East Siberian shelf (Figure 11 right and Figure 16 above). An elongated set of methane eruption zones occur on the submarine slope north of Svalbard flanking the Gakkel Ridge and result from methane hydrate decomposition caused by sudden changes in pressure and temperature conditions due to submarine slides/slumps (Figure 9 above). These submarine slides/slumps were evidently set off by seismic activity along the Gakkel Ridge which lies a short distance to the north in an area where the ridge opening is the widest (Figure 16 above). This may be similar to the Storegga slide (Light and Solana, 2002; NGI, 2012). Light and Solana (2002) predicted that the western slopes of Norway and along the Barents Sea to Svalbard, would be especially vulnerable to slope failures in regions of unstable methane hydrate. Here the slowly spreading Gakkel Ridge runs as close as 30 km to the slope. Earthquake activity along the Gakkel Ridge often has magnitudes greater than 4 to 6 at depths shallower than 10 km (Avetisov, 2008) and will also be destabilizing the already unstable methane hydrates here leading to eruptions of methane into the atmosphere (Figure 9 above and Figure 16 above). There are some 1000 Gt to 1400 Gt (10^9 tonnes) of carbon contained in the methane hydrates on the East Siberian Arctic Shelf and 700 Gt of free methane is trapped under the Arctic submarine permafrost (Shakova et al. 2008, 2010). Shakova et al. 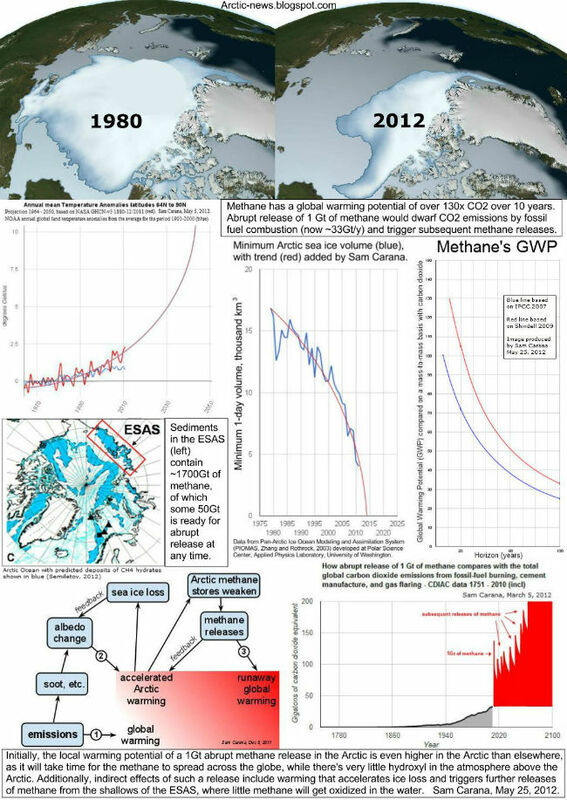 estimate that between 5% to 10% of the subsea permafrost (methane hydrates) in that region is now punctured allowing methane to escape at a rate of about 0.5 Mt (500,000 tonnes) a year and that up to 50 Gt (10^9 tonnes) could be released abruptly at any time soon. 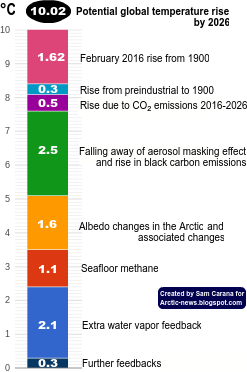 Release of this subsea Arctic methane would increase the worldwide atmospheric methane content about 12 times equivalent to doubling the carbon dioxide content of the atmosphere. This "methane hydrate gun", which is cocked and ready to fire at any moment, is an extremely serious scenario that will cause abrupt climate change (CCSP, 2008; IMPACTS 2008). 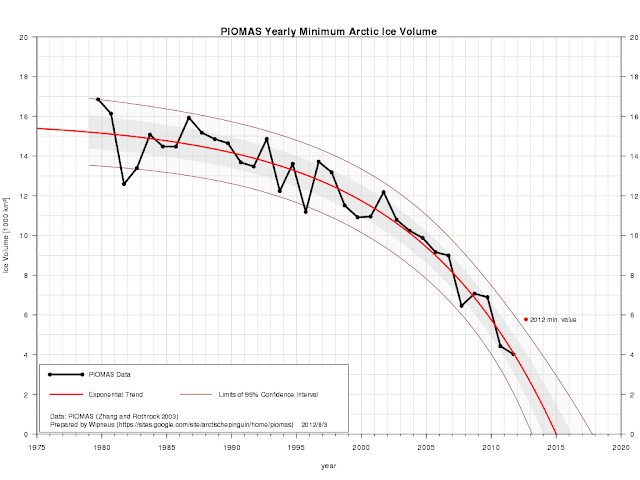 Even if this subsea volume of Arctic methane is released over a longer interval of some ten to twenty years it will still result in a massive feedback on global warming and drive the Earth on an irretrievable plunge into total extinction. After 2015, when the Arctic Ocean becomes navigable (Figure 5 above, Carana 2012b) it will be possible to set up a whole series of drilling platforms adjacent to, but at least 1 km away from the high volume methane eruption zones and to directionally drill inclined wells down to intersect the free methane below the sealing methane hydrate permafrost cap within the underlying fault network (Figure 18 above). High volume methane extraction from below the subsea methane hydrates using directional drilling from platforms situated in the stable areas between the talik/fault zones will reverse the methane and seawater flow in the taliks and shut down the uncontrolled methane sea water eruptions (Figure18 above). The controlled access of globally warmed sea water drawn down through the taliks to the base of the methane hydrate - permafrost cap will gradually destabilize the underlying methane hydrate and allows complete extraction of all the gas from the methane hydrate reserve (Figure18 above). The methane extraction boreholes can be progressively opened at shallower and shallower levels as the subterranean methane hydrate decomposes allowing the complete extraction of the sub permafrost reserve (Figure18 above). The methane and seawater will be produced to the surface where the separated methane will be processed in Floating Liquefied Natural Gas (FLNG) facilities and stored in LNG tankers for sale to customers as a subsidised green alternative to coal and oil for power generation, air and ground transport, for home heating and cooking and the manufacture of hydrogen, fertilizers, fabrics, glass, steel, plastics, paint and other products. Where the trapped methane is sufficiently geopressured within the fault system network underlying the Arctic subsea permafrost and is partially dissolved in the water (Light, 1985; Tyler, Light and Ewing, 1984; Ewing, Light and Tyler, 1984) it may be possible to coproduce it with the seawater which would then be disposed of after the methane had be separated from it for storage (Jackson, Light and Ayers, 1987; Anderson et al., 1984; Randolph and Rogers, 1984; Chesney et al., 1982). Many methane eruption zones occur along the narrow fault bound channels separating the complex island archipelago of Arctic Canada (Figure 6 and 9). In these regions drilling rigs could be located on shore or offshore and drill inclined wells to intersect the free methane zones at depth beneath the methane hydrates, while the atmospheric methane clouds could be partly eliminated by using a beamed interfering radio transmission system (Lucy Project) (Light 2011a). A similar set of onshore drilling rigs could tap subpermafrost methane along the east coast of Novaya Zemlya (Figure 6 below and 9 above). Methane is a high energy fuel, with more energy than other comparable fossil fuels (Wales 2012). As a liquid natural gas it can be used for aircraft and road transport and rocket fuel and produces little pollution compared to coal, gasoline and other hydrocarbon fuels. 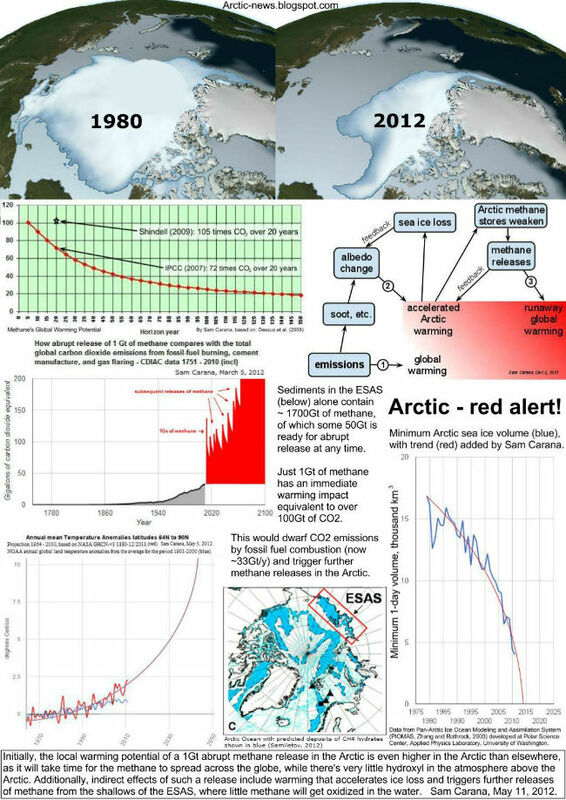 Support should be sought from the United nations, World Bank, national governments and other interested parties for a subsidy (such as a tax rebate) of some 5% to 15% of the market price on Arctic permafrost methane and its derivatives to make it the most attractive LNG for sale compared to LNG from other sources. This will guarantee that all the Arctic gas recovered from the Arctic methane hydrate reservoirs and stockpiled, will immediately be sold to consumers and converted into safer byproducts. This will also act as an incentive to oil companies to produce methane in large quantities from the Arctic methane hydrate reserves. In this way the Arctic methane hydrate reservoirs will be continuously reduced in a safe controlled way over the next 200 to 300 years supplying an abundant "Green LNG" energy source to humanity. 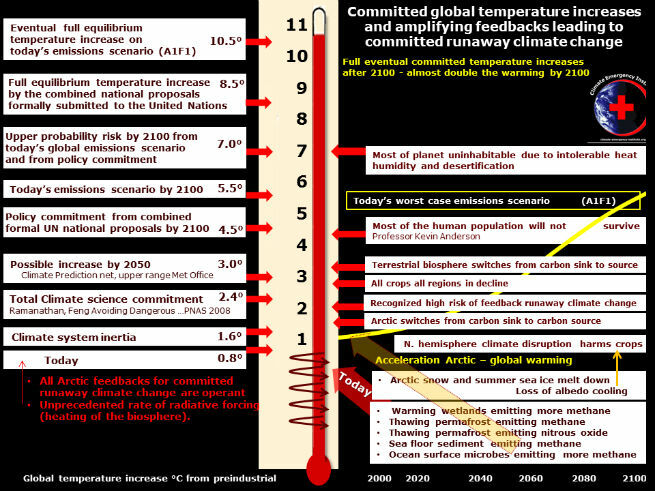 The Climate Emergency Institute recently produced the image below. For more background, see the institute's page on the warming that Earth's is already committed to even if people's emissions were suddenly stopped. Also see the institute's warning on Food Security. 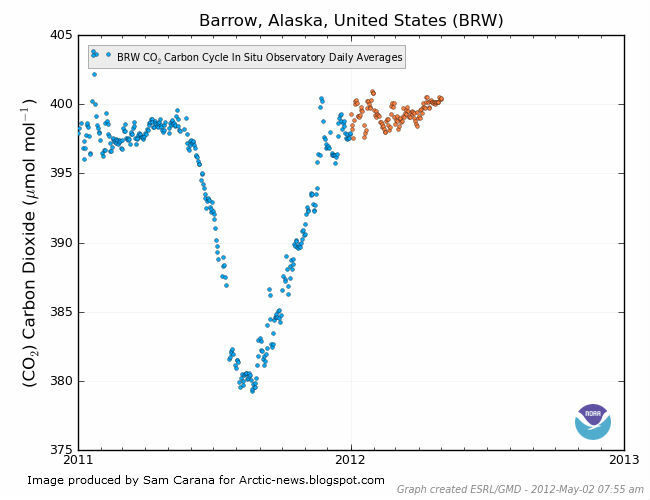 Carbon dioxide levels are at an all time high. The image below, with hourly averages, shows recent measurements that are well over 396 ppm. Formal figure for the week started April 22, 2012, is 396.61 ppm at Mauna Loa, Hawaii. 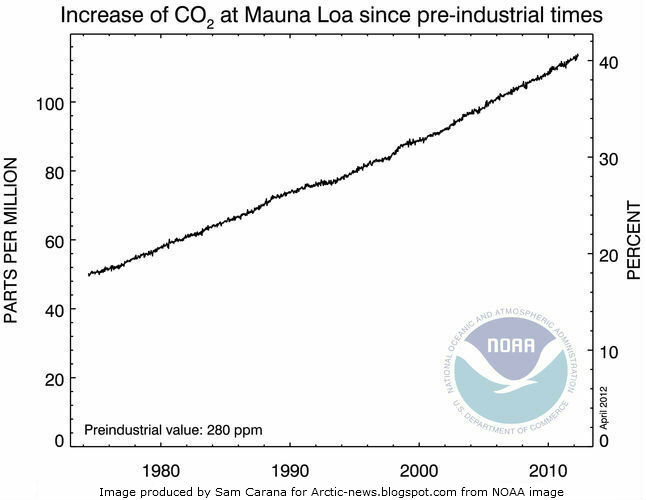 The image below shows the atmospheric increase of CO2 over 280 ppm in weekly averages of CO2 observed at Mauna Loa. The preindustrial value of 280 ppm is close to the average of CO2 between 1000 and 1800 in an ice core from Law Dome, Antarctica. For comparison with pre-industrial times the Mauna Loa weekly data have been first deseasonalized by subtracting the observed average seasonal cycle, and then subtracting 280 ppm. 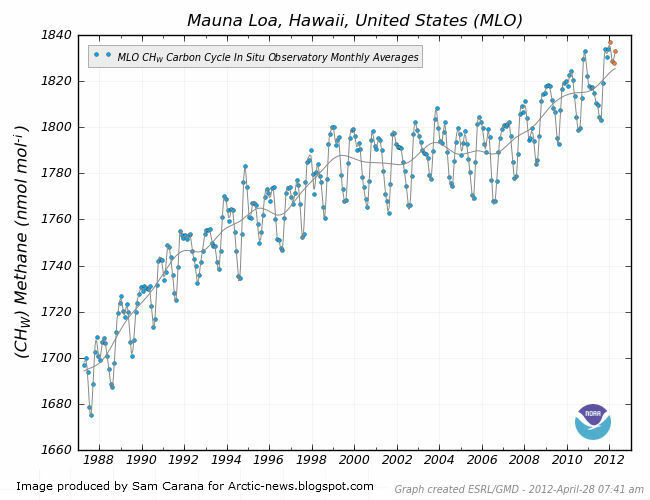 The image below shows the results for carbon dioxide global monthly averages for the period 1979-2010. 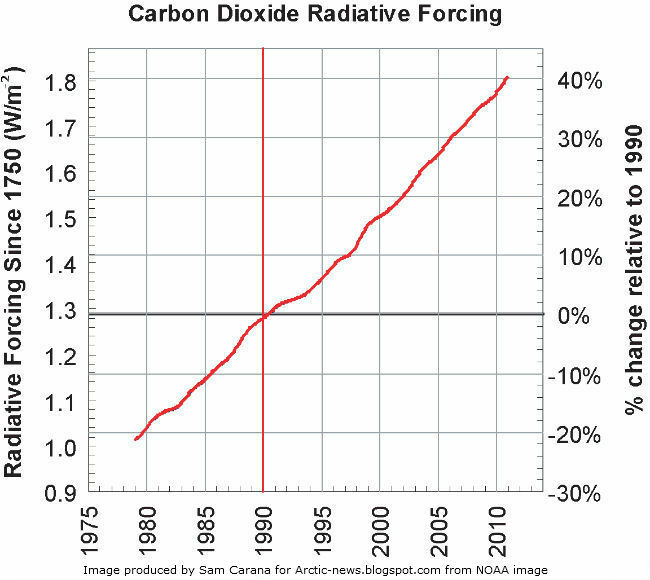 The axis on the left shows the radiative forcing in Watts per square meter, relative to 1750, due to carbon dioxide alone since 1979. 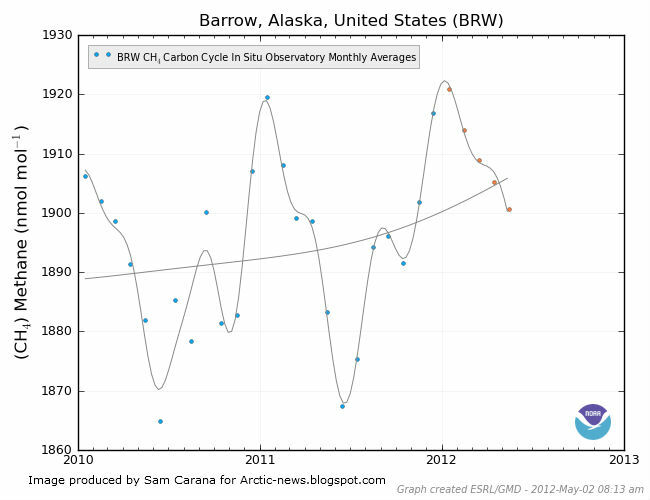 The situation is even worse in the Arctic, where carbon dioxide levels can reach values over 400 ppm, as illustrated by the image below showing carbon dioxide measurements at Barrow, Alaska. Apart from carbon dioxide, there are further forcers such as methane. 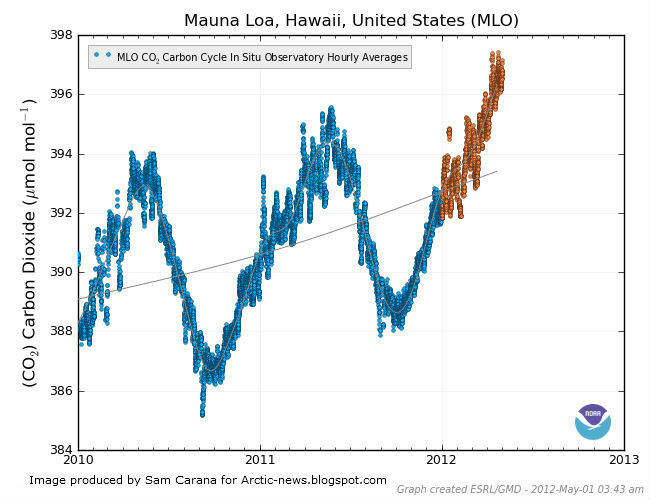 The image below shows methane levels at Mauna Loa, Hawaii. 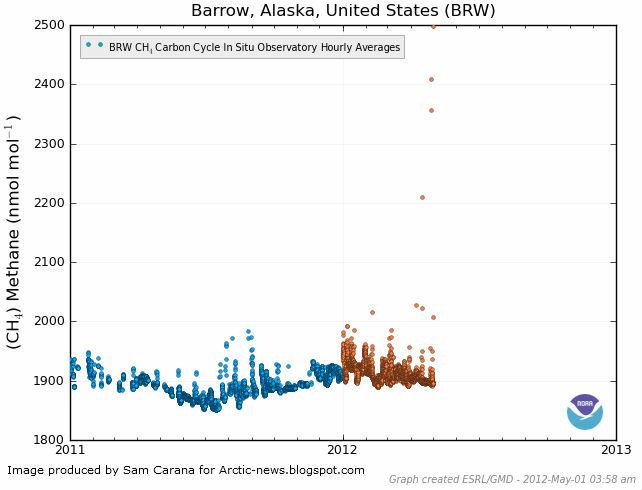 Methane levels are again higher in the Arctic, as illustrated by the image below showing methane levels at Barrow, Alaska, of well over 1900 ppb. Figures for methane on above image are monthly averages, showing recent levels well over 1900 ppb. The situation looks even more worrying when looking at hourly averages, showing measurements of up to 2500 ppb. The fact that such high levels occur is alarming. 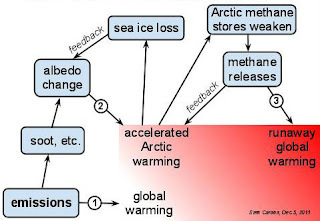 The danger is that radiative forcing will be extremely high in summer in the Arctic, due to high levels of greenhouse gases and other emissions, which will speed up the loss of sea ice, resulting in even further warming that increases the danger that large amounts of methane will be released from hydrates and from free gas in sediments under the water. This danger is further increased by the many feedbacks, as depicted in the Diagram of Doom. For a more detailed description of the many feedbacks, see the Diagram of Doom.